$29.95, plus tax and shipping. Click the BUY NOW button below. 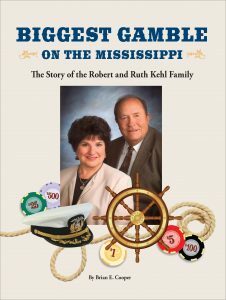 Long before they secured the first riverboat casino license issued in the United States, Robert and Ruth Kehl were gamblers. Time after time, the Iowa natives placed substantial bets ─ going “all in” ─ on themselves. Bob and Ruth repeatedly used their entrepreneurial spirit, legendary work ethic and self-confidence to parlay their success into the next opportunity ─ several times putting all they owned into the venture. They advanced from operators of a small diner in Dubuque to operators of a single excursion boat to owners of a fleet of vessels to riverboat casino operators to riverboat brokers engaged in multi-million-dollar deals. Their gambles were often linked to the Mississippi River ─ riverboats and river communities. Their path to success passed through the Oval Office, where in 1986 President Reagan personally congratulated them on their selection as National Small Business Owners of the Year. The national honor was a pinnacle achievement for Bob, who as a boy lived in a farmhouse lacking electricity and running water, and Ruth, who grew up on a small farm in Southern Iowa. But greater success was yet to come. When riverboat casinos won approval in Iowa, the first license issued in the country went to the Kehls. As their financial fortunes grew, Bob and Ruth took care to give back to the communities in which they operated – in most cases, they were river communities. It’s a tradition of generosity that continues today with their next generation. Biggest Gamble on the Mississippi is a tale of triumph tempered by tragedy. It’s a story of rags to riches. It’s a story of Bob and Ruth Kehl and their family, who repeatedly bet on themselves – and won.